The exact treatment which your doctor recommends will depend on the results of all the tests that were carried out at and immediately after diagnosis. Understanding what is happening to you and why it is needed will help you to cope, both at the outset and as your treatment proceeds. Before you start treatment, it is important to ask your doctor what the treatment options are, how effective they are likely to be and what side effects you may encounter. Every patient will respond slightly differently, so it is impossible for doctors to tell you exactly how you will react, but it is possible to give a good general indication. They will also be able to tell you what is likely to happen if you decide not to have a particular treatment. Make sure you tell your doctor or nurse if you have any new symptoms or if your existing symptoms get worse, so that your treatment can be modified or changed if necessary. Most side-effects of treatment are short-lived and can be reduced with supportive treatment. It is also important to find out from your doctor about any developments which would mean that you should call for medical help during your treatment. While your active treatment is under way, it can be easy to feel that what you are going through is hard to bear. 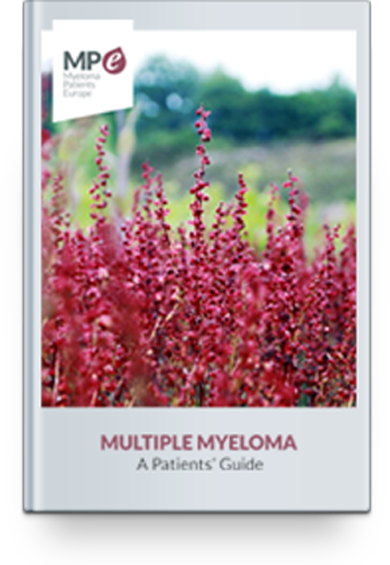 Living with myeloma is much more of a challenge than simply enduring the symptoms and side effects of treatment, since it will inevitably interfere with at least some of your normal activities. You may feel a sense of loss of time and freedom to do what you want. At times this can make you feel depressed, angry or resentful. You may feel isolated and that other people don’t understand what you are feeling or are afraid to talk with you about it. All of these feelings are completely natural, and they will recede as you start to respond to your treatment. Try to think positively and do things you enjoy, but don’t feel guilty if some days are not so good. Joining a myeloma support group or online forum can be enormously helpful in sharing advice and keeping up your morale. Once your treatment period is over, you should be feeling much better and able gradually to take up your normal life activities again. In some countries and some cases, maintenance treatment, e.g. a low dose of thalidomide, is given over a long period with the aim of making the period of remission last as long as possible. In other instances a consolidation treatment can be given for a short time after the end of the main therapy to obtain the maximum benefit. Both of these options may be beneficial, but there is still not enough evidence and not everyone will benefit from them. If you have not responded to your treatment as well as anticipated, or if the myeloma stops responding in a relatively short time, this is known as refractory myeloma. It can be very disappointing, but it does not mean that you will not respond to a second-line course, usually of a different treatment. An indication that a treatment has not been successful is a return or increase of symptoms, including bone pain and lack of energy. The relapse will be confirmed by tests; principally a rising level of paraprotein in your blood. The second-line treatment will usually include a steroid and either bortezomib (Velcade) or lenalidomide (Revlimid). Try to keep positive, as a repeat or different treatment will often return the myeloma to a stable phase and there are many treatment options to be tried.